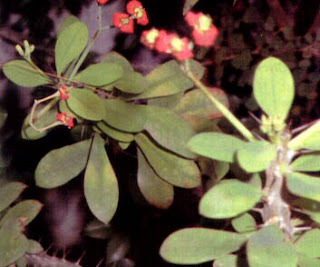 Medical plant pakis giwang for the indonesia name or Euphorbia milii Ch.des Moulins)in the name of botanical generaly Grow, reaching 1 m, usually as an ornamental plant in gardens, containing sap. Brown sticks, barbed rough. Single leaf with rounded edges is a more oval shape from the bottom, edge color, flat green. Stemmed flowers, and there is no single compound (called siatium Typical), a variety of colors, there 0ranye, yellow, dice and so on. CHEMICALAND EFFECTS pharmacological: Feels bitter, astringent, neutral, slightly poisonous (toxic). Interest to stop the bleeding.